Conventionally, orthodontic treatment was considered as a treatment modality for healthy young people. However, with increasing patient awareness, the trend has changed with adults now seeking orthodontic treatment. Considering the current lifestyle and habits, many adults are suffering from chronic diseases, one such disease is diabetes mellitus (DM). The clinician should, therefore, understand the consequences of DM in relation to dental and/or orthodontic treatment and should have a basic knowledge and understanding of this disease and its impact on the oral cavity. This article briefly deals with the medical aspects of DM, its oral manifestations and orthodontic treatment considerations. DM is a chronic disorder of carbohydrate, fat, and protein metabolism. A defective or deficient insulin secretory response, which translates into impaired carbohydrate use, is a characteristic feature of DM, as is the resultant hyperglycemia. A persistently raised blood glucose level (hyperglycemia) is also a characteristic feature, resulting from deficiency in insulin secretion, insulin action, or both. The classic symptoms of marked hyperglycemia include polyuria, polydipsia, weight loss, and susceptibility to infections. Long-term complications include retinopathy, nephropathy, peripheral and autonomic neuropathy, cardiovascular disease, and in addition, increased tendency for periodontal disease is often found. 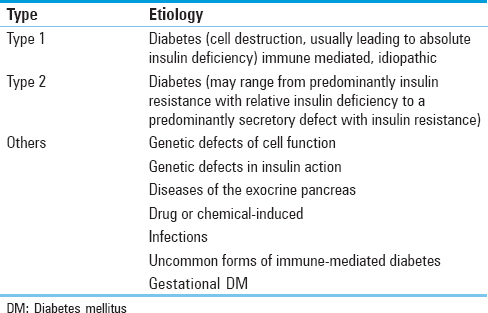 The two broad categories of DM are designated Type 1 and Type 2. In Type 1 diabetes, the cause is an absolute deficiency of insulin secretion. It is often diagnosed in adolescence and therefore was called “juvenile-onset diabetes.” Type 2 DM is a heterogeneous group of disorders. Distinct genetic and metabolic defects in insulin action and/or secretion give rise to the common phenotype of hyperglycemia in Type 2 DM. In addition to these types, there are other specific types of DM [Table 1]; Rizvi, et al. Diabetes Mellitus in Orthodontics. J Orthod Res 2014;2:117]. Peak incidence of Type 2 DM is in the fifth decade of life due to increasing obesity and reduced activity levels. The prevalence of DM is growing rapidly worldwide and is reaching epidemic proportions. It is estimated that there are currently 285 million people with diabetes worldwide and this number is set to increase to 438 million by the year 2030. according to the world diabetes Atlas More Details, India is projected to have around 51 million people with diabetes. The primary methods used to diagnose diabetes are fasting venous plasma glucose levels and oral glucose tolerance tests. Oral glucose tolerance tests used in the past tended to give false positive results because of stress-induced adrenaline release that impairs the response to glucose loading. Diagnosis can be made from a simple fasting venous plasma glucose level. measurement is taken from a fasting sample of blood and provides information on the level of control of diabetes throughout the 30–90 days half-life of red blood cells. Iatrogenic after the administration of corticosteroids. In addition to these, there are many other factors involved. Type 1 DM develops as a result of the synergistic effects of genetic, environmental, and immunologic factors that ultimately destroy the pancreatic beta cells. Individuals with a genetic susceptibility have normal beta cell mass at birth but begin to lose beta cells secondary to autoimmune destruction that occurs over months to years. In Type 2 diabetes, the cause is a combination of resistance to insulin action and an inadequate compensatory insulin secretor response. In This type of diabetes, the hyperglycemia develops gradually and starts usually at the age of 40 or later. A striking feature of Type 2 diabetes is the strength of its genetic component, which is much greater than in Type 1 diabetes. Type 2 diabetes is highly concordant, being 60%–90% concordant in monozygotic twins, but less so in nonidentical twins (17%–37%). For example, if one of the two identical twins develops Type 1 diabetes, the other twin has only about a 50% chance of developing diabetes; but if one twin develops Type 2 diabetes, the other twin has about a 100% chance of also becoming diabetic. Approximately, half of the patients with diabetes are undiagnosed and a dental examination may provide the first indication of the disease, and therefore, a clinician must have a basic knowledge of the oral manifestations of DM. These include dry mucous membranes (xerostomia), oral candidiasis, burning mouth or tongue (glossopyrosis), impaired wound healing, recurrent oral infections, ketone breath, cheilosis, mucosal drying and cracking, diminished salivary flow, alterations in the flora of the oral cavity, with greater predominance of Candida albicans, hemolytic streptococci, and staphylococci and an increased rate of dental caries. Occasionally, enlargement of the parotid salivary gland can be noticed., Diabetic patients on hypoglycemic agents have xerostomia, which may predispose to opportunistic infections with C. albicans. Oral manifestations associated with diabetes are in most cases restricted to the uncontrolled or poorly controlled patient. Factors that may contribute to the oral complications in diabetes include decreased polymorphonuclear leukocyte function (leads to impaired resistance to infections) and abnormal collagen metabolism. Altered protein metabolism resulting from impaired utilization of glucose can contribute to increased breakdown of collagen in the connective tissues. In addition, impaired neutrophil chemotaxis and macrophage function may add to the impaired wound healing responses in diabetic patients. Healing is impaired in diabetics due to decreased synthesis of collagen by fibroblasts, increased degradation by collagenase, glycosylation of existing collagen at wound margins, defective remodeling rapid degradation of newly synthesized poorly cross-linked collagen and reduced the vascularity of tissues due to defective collagen in the vessel wall. Diabetes mellitus patients have more gingival inflammation, probably because of impaired neutrophil function. Vascular changes, such as DM-related microangiopathies, have been shown to encourage periodontal disease. This was also confirmed by Rylander et al., who compared the periodontal conditions of 46 young insulin-controlled DM patients with 41 healthy young adults. They reported significantly more gingival inflammation in the young DM patients with retinopathy and nephropathy compared with those without complications. Due to periodontal disease tends to be more common and more extensive in patients with uncontrolled or poorly controlled DM, one could hypothesize that normalizing the blood glucose levels should stop the progression of periodontal disease. This is, however, not true. Sastrowijoto et al. Demonstrated that better metabolic control in Type 1 patients did not improve the clinical periodontal condition; it ameliorates only when local oral hygiene measures are used. The periodontal condition will continue to deteriorate when the blood glucose level is not well controlled. Hypoglycemia can cause significant morbidity and can be lethal, if severe and prolonged. When a hypoglycemic reaction occurs in the dental office, the dentist should recognize the symptoms and act in an appropriate way. Loss of consciousness in insulin shock can occur quite rapidly, within minutes after the appearance of the first symptoms. At the onset, patients appear weak, nervous, and confused. Their skin is moist and pale, and they exhibit an excessive flow of saliva. respiration is normal, the pulse is full and pounding, and blood pressure is usually normal. Frequently, a tremor may be noted. The still cooperative and conscious patient with these clinical symptoms should be administered A high-carbohydrate beverage such as orange juice or cola (not diet). When treating a diabetic patient, it is advised to have a source of sugar available in the office that is handy for quick and easy use. The patient will respond within a few minutes and should then remain under observation until all signs and symptoms have disappeared. If the state of hypoglycemia continues, the patient will soon become unconscious unless a 50% dextrose solution (50 ml) is administered intravenously at once. Management of the unconscious patient also includes airway maintenance, oxygen administration, and monitoring of vital signs. Another drug that can be administered is glucagon (1 mg intramuscularly), which is also preferable if the patient is conscious but uncooperative to take carbohydrates orally. The key to any orthodontic treatment is good medical control. Orthodontic treatment on uncontrolled diabetics should be avoided. If the patient is not in good metabolic control (HbA1c >9%), every effort should be made to improve blood glucose control. There is no treatment preference with regard to fixed or removable appliances. It is important to stress good oral hygiene especially when fixed appliances are used. These appliances may give rise to increased plaque retention, which could more easily cause tooth decay and periodontal breakdown in these patients. The blood glucose levels should be monitored to rule out deterioration of the DM control. Diabetes-related microangiopathy can occasionally occur in the periapical vascular supply, resulting in unexplained odontalgia, percussion sensitivity, pulpitis, or even loss of vitality in sound teeth. Especially with orthodontic treatment when forces are applied to move teeth over a significant distance, the practitioner should regularly check the vitality of the teeth involved. It is advisable to apply light forces and not to overload the teeth. Holtgrave and Donath studied periodontal reactions to orthodontic forces. They found retarded osseous regeneration, weakening of the periodontal ligament, and microangiopathies in the gingival area. They concluded that the specific diabetic changes in the periodontium are more pronounced after orthodontic tooth movement. Due to DM patients, and especially those who are uncontrolled or poorly controlled, have a higher tendency for periodontal breakdown, they must be considered in the orthodontic treatment plan as periodontal patients, and treatment considerations must accordingly be made. If plaque control is difficult to achieve with mechanical aids such as toothbrush and interdental brush, using a disinfectant mouth rinse such as chlorhexidine as an adjuvant chemical plaque control can be considered. To minimize the neutralizing effect of the toothpaste on the chlorhexidine molecule, there should be at least a 30 min interval between tooth brushing and the chlorhexidine rinse. Because today, there is no upper age limit for orthodontic treatment, the practitioner will see both Type 1 and Type 2 DM Patients. Type 2 patients can be considered more stable than Type 1 patients, who can be presumed to be “Brittle.” Morning appointments are preferable. If a patient is scheduled for a long-treatment session, E. G., About 90 min, he or she should be advised to eat a usual meal and take the medication as usual. At each appointment, before the dental procedure starts, the dental team should determine whether the patient has fulfilled these recommendations, to avoid a hypoglycemic reaction in the office. Diabetes may also affect bone turnover, resulting in diminished bone-mineral density, osteopenia, osteoporosis. And an increased prevalence and severity of periodontal disease. Several mechanisms have been reported to explain the altered bone remodeling in diabetes, one of which is diminished bone formation as a result of decreased osteoblastic activity or enhanced apoptosis of osteoblastic cells. Another contributing factor may be increased bone resorptive activity. However, it is still controversial whether osteoclastic recruitment and function are altered in diabetes because no change or decrease in the activity of osteoclasts has been reported. Chemokine, cytokines, and bone-remodeling regulators. Influence the recruitment and activity of osteoclasts and osteoblasts. Recent reports demonstrated increased expression of messenger ribonucleic acid (MRNA) For ccl2, Ccl5, tumor necrosis factor-alpha (TNF-alpha), and receptor activator of nuclear factor- kappa-B ligand (RANKL) That are associated with osteoclast recruitment and activity during orthodontic movement. Previous investigators have reported that diabetes is associated with prolonged expression of MRNA For TNF-Alpha, CCL2, RANKL, and colony-stimulating factor 1, which may lead to more persistent inflammation and tissue damage. However, the cellular and molecular mechanisms associated with the diabetic state that may influence orthodontic movement are not known. Orthodontic bands placement and separator placement may produce significant bacteremia where significant oral bleeding and/or exposure to potentially contaminated tissue is anticipated, and this would typically require antibiotic prophylaxis in patients at risk., Simple adjustment of orthodontic appliances, do not require antibiotic prophylaxis. The mini-implant retention results from the mechanical interlocking of its metal structure in cortical and dense bone and is not based on the concept of osseointegration. One of the key success factors are bone quality and/or density. Well-controlled diabetic patients can undergo mini-screw placement under antibiotic prophylaxis. Due to the high prevalence of DM, the probability of the orthodontist treating such patients is also very high. Therefore, it is the responsibility of an orthodontist as well as of the dentist to have a basic knowledge of the signs and symptoms of DM. Patients having good glycemic control can undergo orthodontic treatment whereas treatment of uncontrolled diabetics is not indicated. Stress should be laid on good oral hygiene, regular check of the periodontium as well as vitality check of the teeth. Light forces should be applied. Emphasis should also be on regular glycemic tests. As orthodontists, we must strive to improve the treatment of our patients and elevate the standard of our specialty to its biologic science status by paying attention to the biologic aspects of treatment as much as to its mechanical aspects. Cotran RS, Kumar V, Collins T. Robbins-Pathologic Basis of Disease. 6th ed. Pennsylvania: Elsevier; 2000. p. 913. Finney LS, Finney MO, Gonzalez-Campoy JM. What the mouth has tosay about diabetes. Careful examinations can avert serious complications. Postgrad Med 1997;102:117-26. Meyle J, Gonzáles JR. Influences of systemic diseases on periodontitis in children and adolescents. Periodontol 2000 2001;26:92-112. Bjork S, Kapur A, King H, Nair J, Ramachandran A. Global policy: Aspects of diabetes in India. Health Policy 2003;66:61-72. Stewart M. Will glycosylated haemoglobin replace the oral glucose-tolerance test? Lancet 1997;349:223-4. Medici F, Hawa M, Ianari A, Pyke DA, Leslie RD. Concordance rate for type II diabetes mellitus in monozygotic twins: Actuarial analysis. Diabetologia 1999;42:146-50. Kasper DI, Braunwald E, Fauci AS, Longo DL, Hauser SL. Harrison's Principles of Internal Medicine. 16th ed. United States of America: McGraw-Hill Companies; 2005. p. 2153, 2158, 2159. Newmon M, Takei HH, Carranza FA. Carranza's Clinical Periodontology. 9th ed. Pennsylvania: Saunders, Elsevier; 2003. p. 208, 209, 210. Bensch L, Braem M, Van Acker K, Willems G. Orthodontic treatment considerations in patients with diabetes mellitus. Am J Orthod Dentofacial Orthop 2003;123:74-8. Rylander H, Ramberg P, Blohme G, Lindhe J. Prevalence of periodontal disease in young diabetics. J Clin Periodontol 1987;14:38-43. Sastrowijoto SH, van der Velden U, van Steenbergen TJ, Hillemans P, Hart AA, de Graaff J, et al. Improved metabolic control, clinical periodontal status and subgingival microbiology in insulin-dependent diabetes mellitus. A prospective study. J Clin Periodontol 1990;17:233-42. Bensch L, Braem M, Willems G. Orthodontic considerations in the diabetic patient. Semin Orthod 2004;10:252-8. Geza T, Rose L. Dental correlations for diabetes mellitus. In: Rose LF, Kaye D, editors. Internal Medicine for Dentistry. 2nd ed. St. Louis: C.V. Mosby; 1990. p. 1153. Holtgrave EA, Donath K. Periodontal reactions to orthodontic forces in the diabetic metabolic state. Fortschr Kieferorthop 1989;50:326-37. Owens J, Addy M, Faulkner J, Lockwood C, Adair R. A short-term clinical study design to investigate the chemical plaque inhibitory properties of mouthrinses when used as adjuncts to toothpastes: Applied to chlorhexidine. J Clin Periodontol 1997;24:732-7. Räkel A, Sheehy O, Rahme E, LeLorier J. Osteoporosis among patients with type 1 and type 2 diabetes. Diabetes Metab 2008;34:193-205. Lappin DF, Eapen B, Robertson D, Young J, Hodge PJ. Markers of bone destruction and formation and periodontitis in type 1 diabetes mellitus. J Clin Periodontol 2009;36:634-41. Fowlkes JL, Bunn RC, Liu L, Wahl EC, Coleman HN, Cockrell GE, et al. Runt-related transcription factor 2 (RUNX2) and RUNX2-related osteogenic genes are down-regulated throughout osteogenesis in type 1 diabetes mellitus. Endocrinology 2008;149:1697-704. Mishima N, Sahara N, Shirakawa M, Ozawa H. Effect of streptozotocin-induced diabetes mellitus on alveolar bone deposition in the rat. Arch Oral Biol 2002;47:843-9. Yano S, Mentaverri R, Kanuparthi D, Bandyopadhyay S, Rivera A, Brown EM, et al. Functional expression of beta-chemokine receptors in osteoblasts: Role of regulated upon activation, normal T cell expressed and secreted (RANTES) in osteoblasts and regulation of its secretion by osteoblasts and osteoclasts. Endocrinology 2005;146:2324-35. Andrade I Jr., Taddei SR, Garlet GP, Garlet TP, Teixeira AL, Silva TA, et al. CCR5 down-regulates osteoclast function in orthodontic tooth movement. J Dent Res 2009;88:1037-41. Graves DT, Naguib G, Lu H, Leone C, Hsue H, Krall E, et al. Inflammation is more persistent in type 1 diabetic mice. J Dent Res 2005;84:324-8. Tong DC, Rothwell BR. Antibiotic prophylaxis in dentistry: A review and practice recommendations. J Am Dent Assoc 2000;131:366-74.